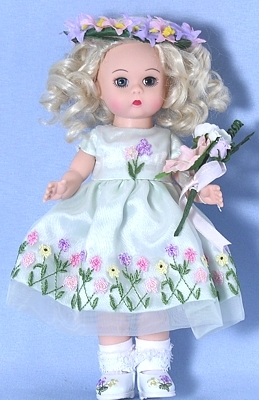 8" Spring Garden Flower Girl is dressed in a flower dress of mint green chiffon and satin embroidered with colorful flowers around the skirt and bodice. She has white maryjanes with flowers. Her curly blonde hair is topped with a floral wreath and she carries a bouquet. She has blue eyes.